Available at LIDL here in the UK and probably easily found in budget supermakets in mainland Europe, Ben Bracken does not take its name from the distillery at which the spirit was produced nor a Ben (beinn, common Gaelic word for 'moutain') near its production site (cuz such a Ben does not exist), but rather they take it from THIS guy. Just kidding. I think it is just a Scottish-sounding name that was not copyrighted and that marketing folks thought would work in German value superstore Lidl. In Scotland, most hills, munros and bens are adorned with ferns, heather or bracken, so the name isn't totally out of left field. "Ben Bracken is a distinctive single malt from the Highland sub-region of Speyside, the very heartland of scotch whisky in the north-east of Scotland. Distilled in copper pot stills in the traditional, centuries-old manner, it is laid down in oak casks, and matured undisturbed form twelve long years." One of the best bottle blurbs I have seen... which isn't saying much. It could have been worse. 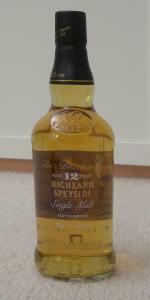 I have read that this mystery Speyside malt is produced by Clydesdale Scotch Whisky Co., a part of the Whyte & Mackay group, and as W&M's only speyside distillery is Tamnavulin, that must be what is inside the bottle. I have also read that it is aged stock that Whyte and Mackay sold when they put Tamnavulin distillery to sleep in 1995. The stills were fired up once again after United Spirits bought Whyte and Mackay in 2007. If you don't like my little exposé on Ben Bracken, go check THIS out (after a few German lessons). Flat, but floral and fragrant; at its best it has a very Glenmorangie style. Sweet vanillas, some yeasty maltiness and a touch of spice. Peaches and sweet breadiness followed by a surge of salt, a bit of raw smoked bacon, and then nutmeg and butter. Finish is drying on poppyseeds and a clean bitterness. Medium long. Simple, but totally pleasant, drinkable whisky. In the mouth it quite coating and pleasant but the aftertaste does it no favours as the drying affect gets almost chemical, like regurgitating paracetemol or tylenol. A pretty tolerable budget drop, but for a few extra quid I would probably shop elsewhere... after getting my oven lasagne, german wieners, and cheap malted loaf at Lidl.